This post is sponsored by White Lily. Since I made these peanut butter cookie cups at the request of Curtis last year, I had to make these chocolate chip cookie cups as well. Because when he drew that diagram for me, he also talked about the chocolate chip cookie ones. I made these a few months back and shared them with friends and they were a HUGE HIT. I’m so excited to share these with you! 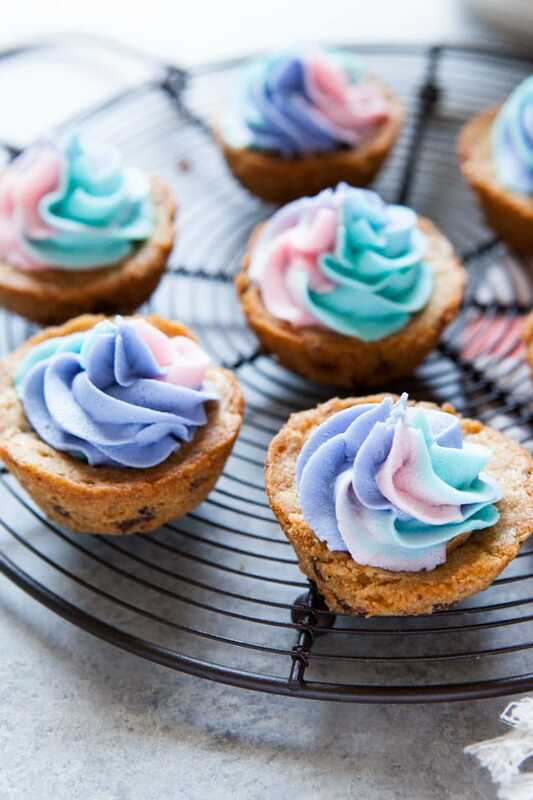 Chocolate chip cookie cups with frosting or icing…however you call it. But I had to, just had to add the unicorn frosting bit. What do you think? Let’s start with the flour. My favorite flour to bake with. I always mix the dry ingredients together first. 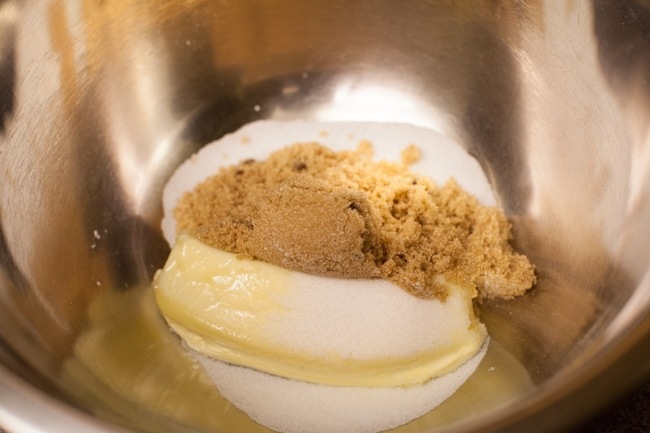 Then, I mix both sugars and the butter together. Then, mix together with vanilla extract and egg. 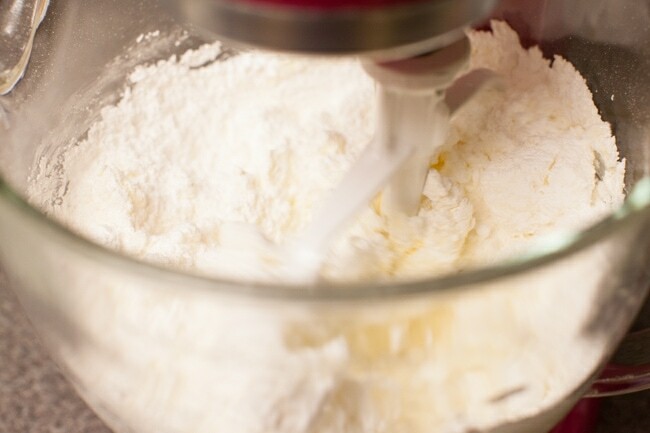 In two batches, add the flour mixture and mix together. 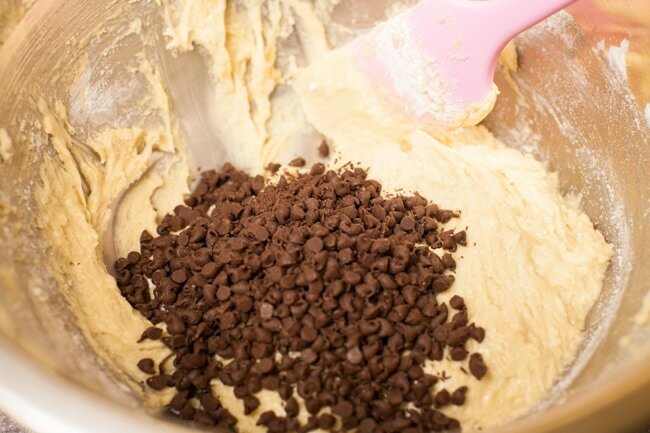 Add the miniature chocolate chips. Since these cups are small, the miniature ones work the best! 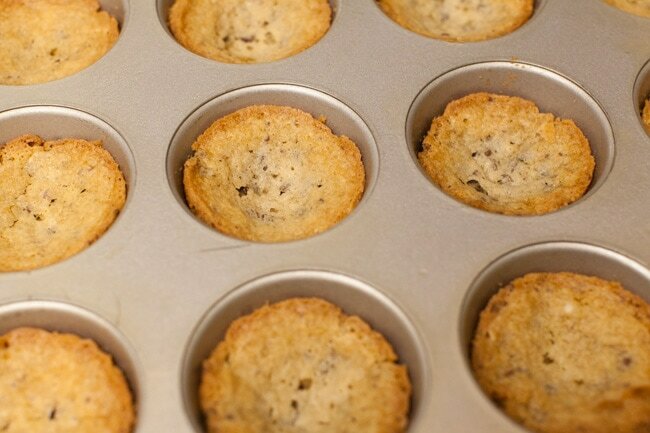 Spray your nonstick muffin pan and use your cookie scoop to scoop uniform sized cookies into the muffin pan. Super easy. You don’t have to push the cookies down or anything. They automatically bake domed in. Perfect for the icing! 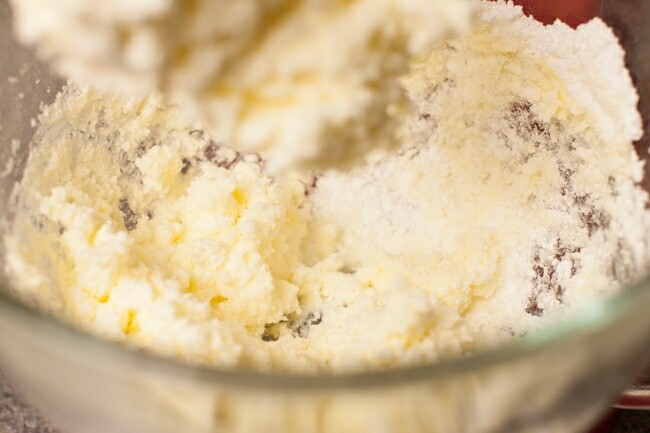 Add the butter to your stand mixer and mix. Add the powdered sugar in batches (don’t add it all at once!). add the milk in one tablespoon at a time. Then, mix it for 5 to 6 minutes. 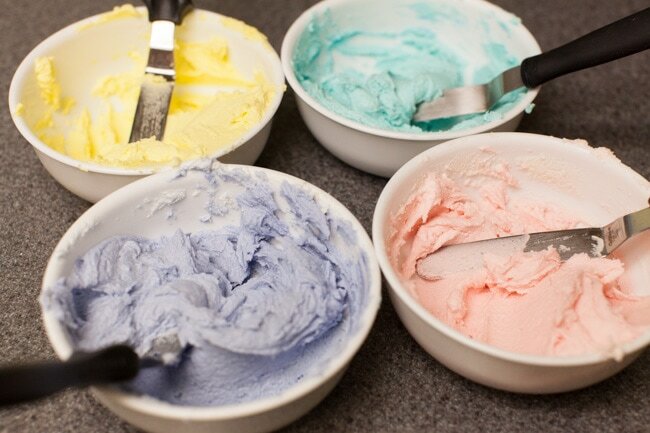 Split the frosting up in bowls to mix your colors. 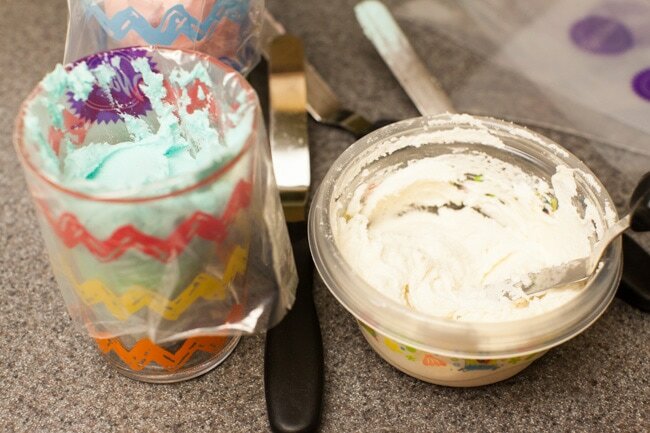 Set up your piping bags, I put them into cups so I can easily put the frosting in. Using the angled spatula, add the frosting to the bags. Add a rubber band to the top and then cut the ends of the bags. 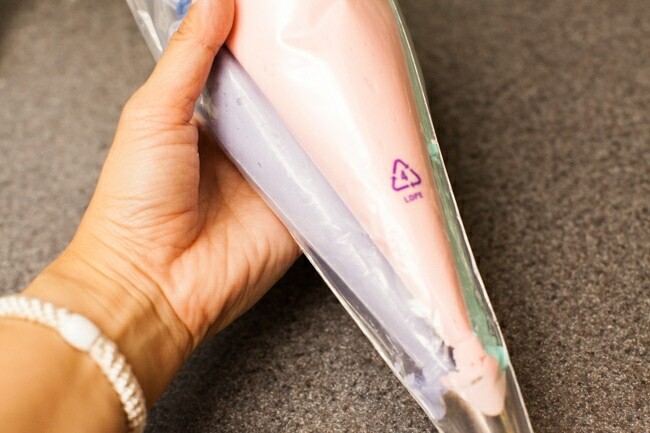 Set up the large piping bag with the tip. 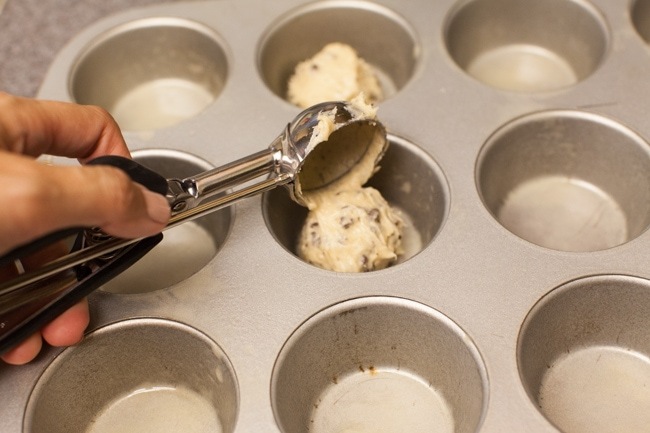 Get your chocolate chip cookie cups ready to frost. Frosting them is easy. It just takes some time and you’ll get used to the pressure you need to put on the bag to get an even design on the frosting. These are sooo good! 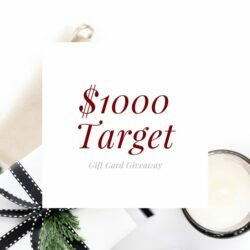 I know you’ll love them! I can’t wait to make them again!! I have a couple of friends who mention these every time I see them! And Curtis loved them too! Prepare a muffin tin by spraying with nonstick baking spray. 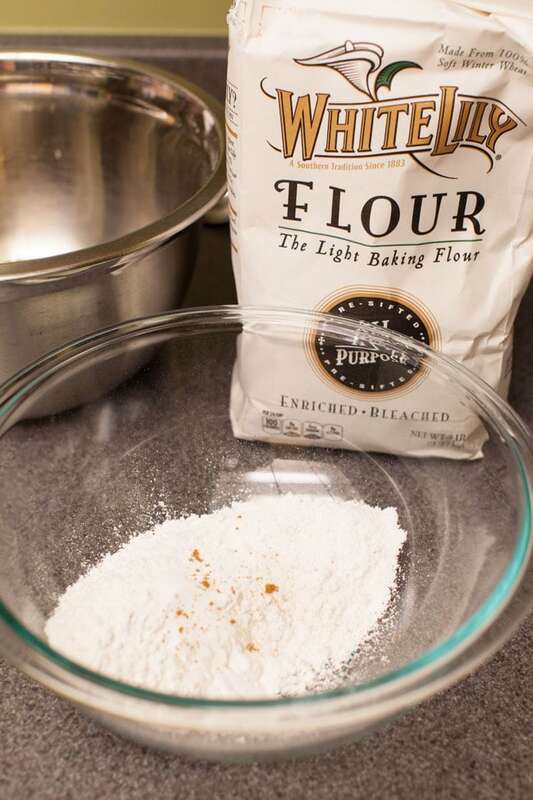 Heat oven to 350 degrees F.
Add White Lily flour, salt, baking soda and ground cinnamon to a medium sized mixing bowl. Mix together and set aside. 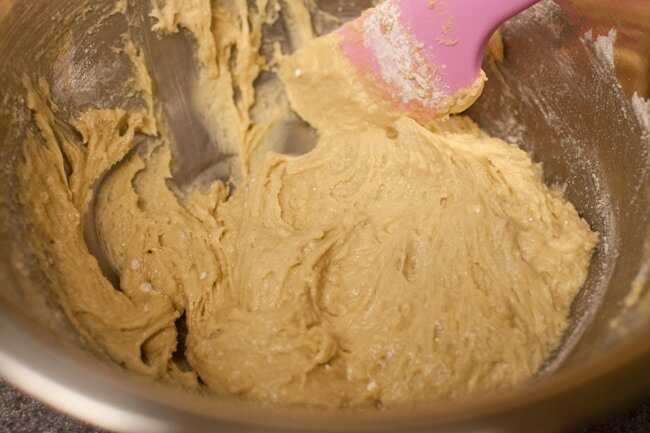 Add butter and both sugars to a medium sized mixing bowl. 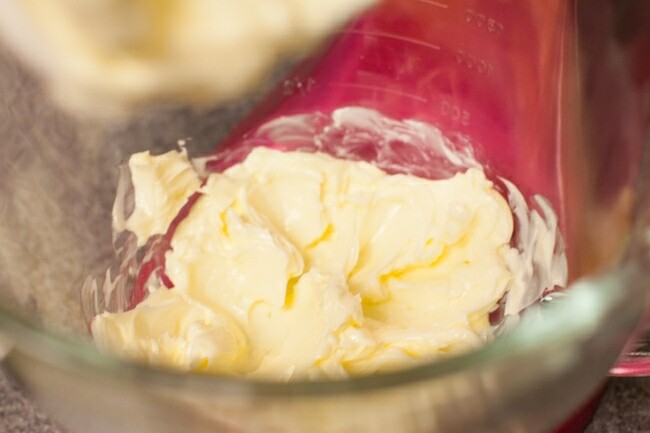 Using an electric hand mixer, cream the butter and sugars together. 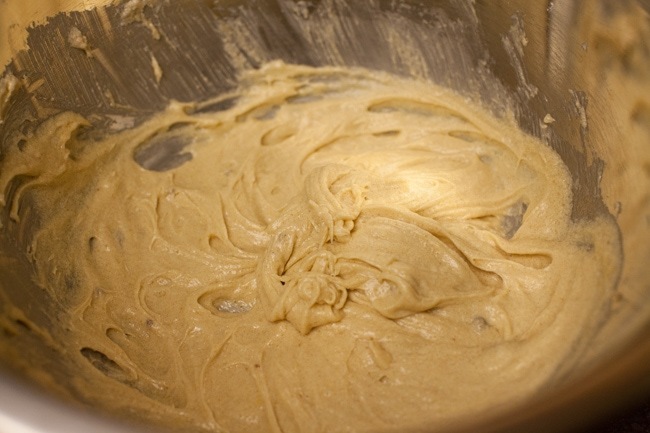 Add vanilla extract and the egg and continue mixing. 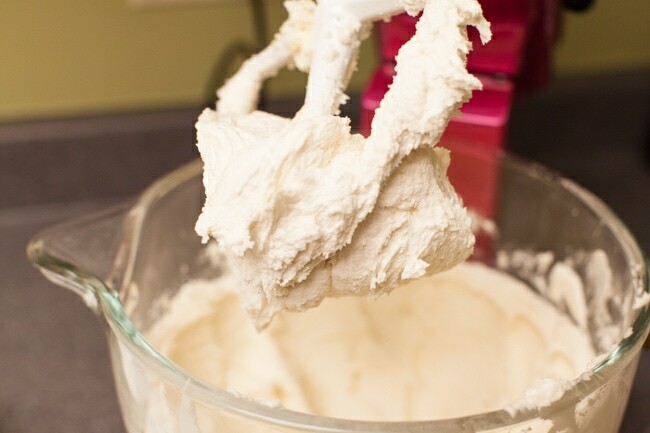 In two batches, add the flour mixture and combine with a rubber spatula, taking care to not over mix. 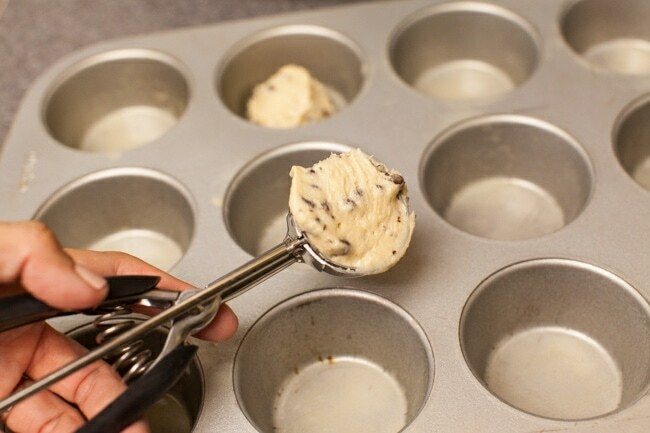 Scoop cookie dough into the prepared muffin tins using a medium cookie scoop. 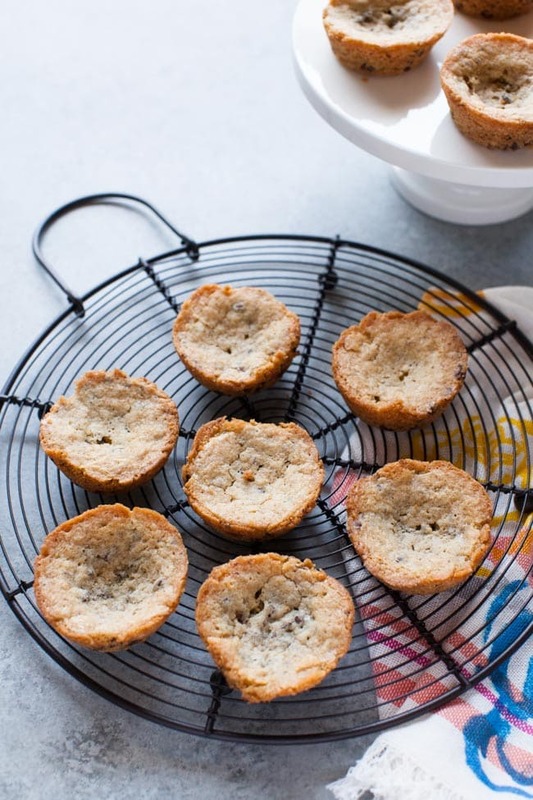 Bake for 13 to 14 minutes, or until a toothpick inserted in the center of a couple of cookie cups comes out with crumbs. Remove from the oven and place the muffin pan on a cooling rack. Allow to cool at least 10 minutes before removing. 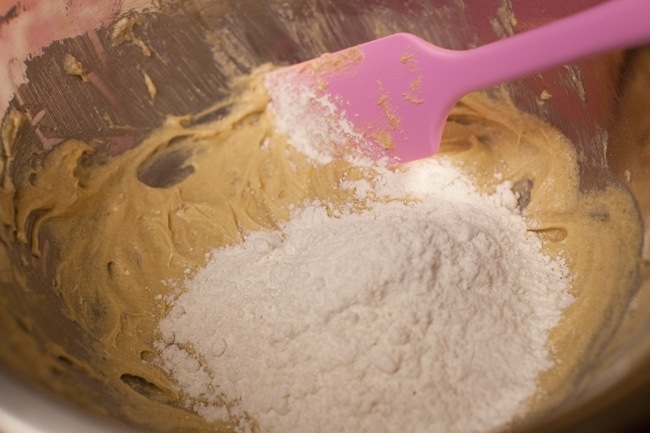 Add butter to the bowl of a stand mixer and mix together with vanilla extract. Add powdered sugar in batches (being careful to not add too much at a time or you’ll have powdered sugar everywhere). Mix until combined. Add the milk, one tablespoon at a time, then mix for 5 to 6 minutes on medium speed. 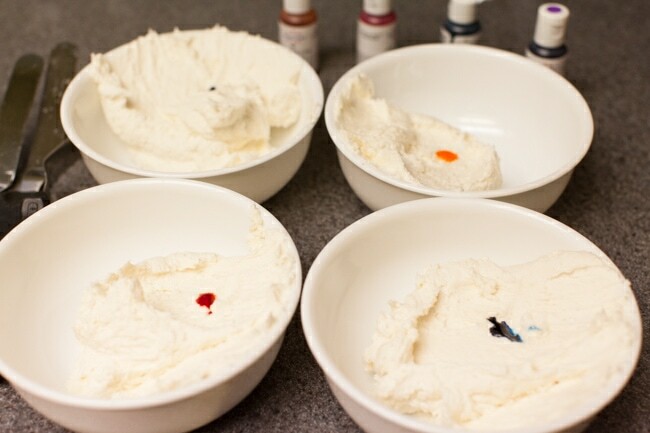 Add frosting to three bowls and split the frosting evenly. Color the frosting accordingly. For the blue, I used one drop of sky blue. For the purple, I used one drop of regal purple and two drops violet. For the pink, I used one drop soft pink and one drop deep pink. Mix with a different angled spatula. Refrigerate the frosting until ready to use. If refrigerated, allow the frosting to sit on the counter for at least 20 minutes. 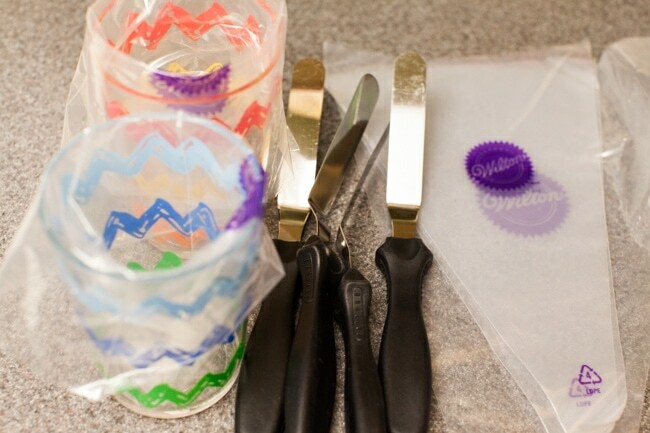 Add the frosting to piping bags set up in a cup or glass (to make it easier to add as well as less mess). 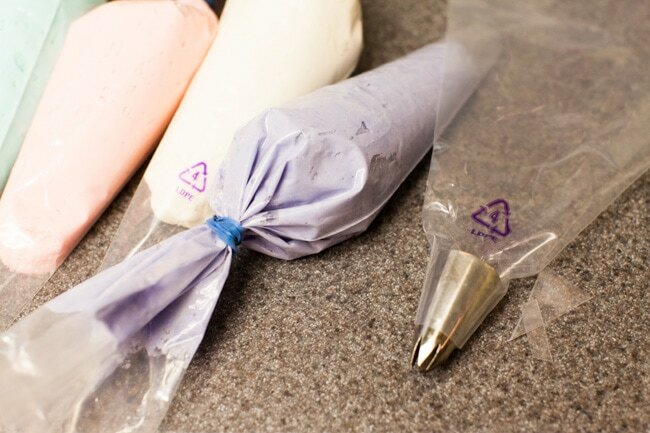 Cut the ends of the piping bags and then add to a prepared 16-inch piping bag that’s fitted with a 1M tip. Push the bags down and pipe onto cooled cookie cups to make the colored swirl you see in my photos. 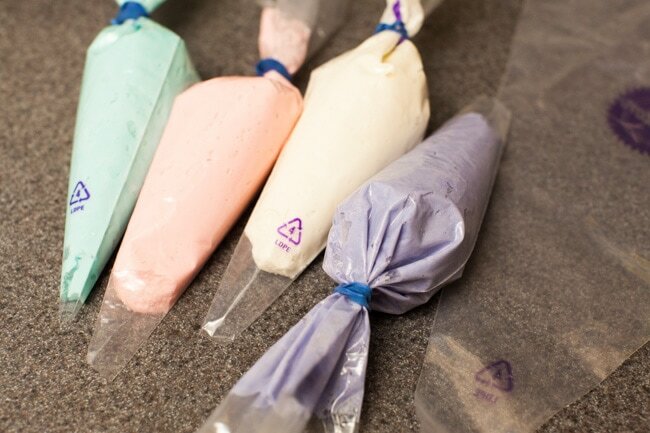 I use gel food coloring to color my buttercream. Disclosure: This post is sponsored by White Lily. All opinions are my own. Thank you for supporting brands that I work with, it allows me to keep doing what I love; sharing on The Little Kitchen. 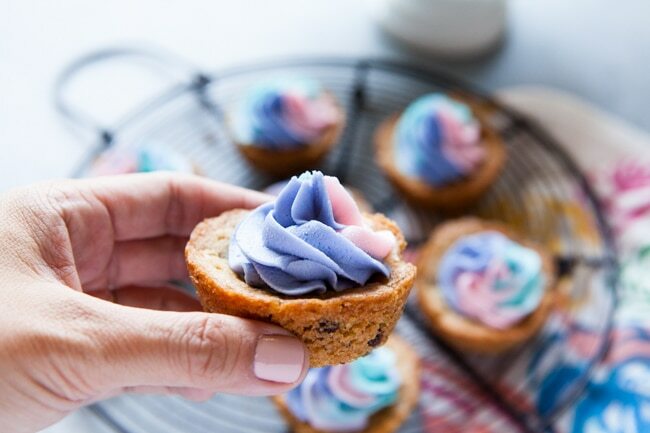 These cookie cups are so easy to make and perfect for partiesz. But you can’t beat how pretty the icing turns out! So adorable! Ooooh. So that’s how you get all the colors mixed like that. So simple yet I never would’ve thought of that. My wife loves decorating with frosting and does all sorts of crazy things with colors. I’ll have to share this with her! Gorgeous photos all around! Hey Julie…! 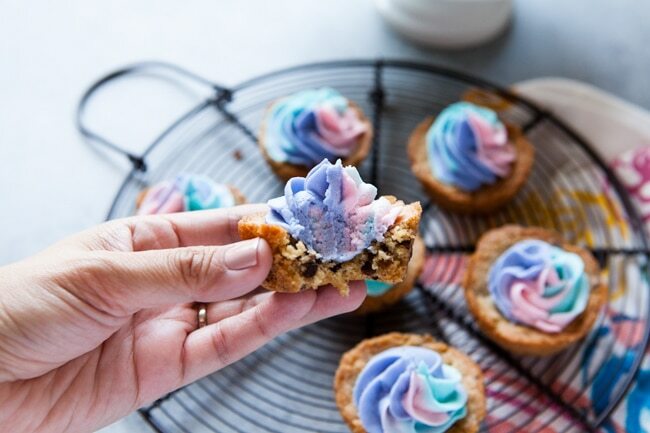 these chocolate chip cookie cups…looks soooo yummy and its easy to make, and i will make this cookie in upcoming weekend. Thanks for sharing and keep shared new ideas….! love how tiny they are…would have slathered wayyyyy morre frosting though!! I kind of want to make these in my heart shaped silicone molds! I love the colors for the icing. My kids would enjoy swirling them! the unicorn frosting would be such a big hit with my daughters, can’t wait to surprise them with this! I love the frosting rosettes. So pretty! These are great for parties! I used this recipe for a baby shower in January and they went over great! 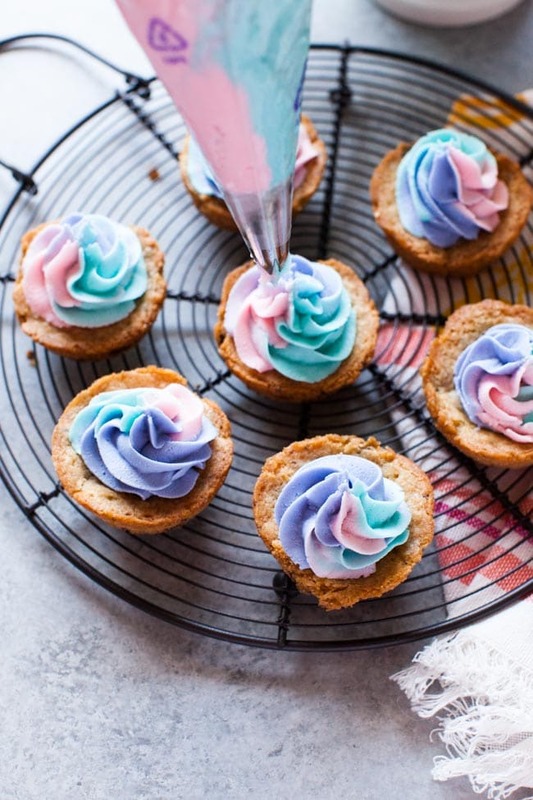 These look both, amazing and fun – my daughter would love the frosting, and I’d love the cookie cup part. I’ve never made chocolate chip cookies as “cups”. Love the frosting!! Sooo fun!! Ahh, these cups are such a cute idea! You could make them for any occasion, too. This is so adorable! I love the colors. This would be fun to make this spring. Say whaaat?!?!? Gotta try these ASAP! YUM!!! Fun! Could change the frosting up for every holiday too (Dark Green, Light Green, and White) for St. Patrick’s day maybe? I can clearly see the treats flying off the plate at home or in any gathering. The frosting is perfect! Another amazing recipe! 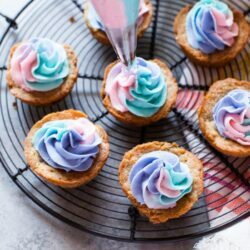 I can’t wait to try these cookie cups! My kids will just love them! Now this I absolutely love!! I can do so much with this recipe and I never thought about baking in a cup cake pan. I would eat this before they even cooled lol. 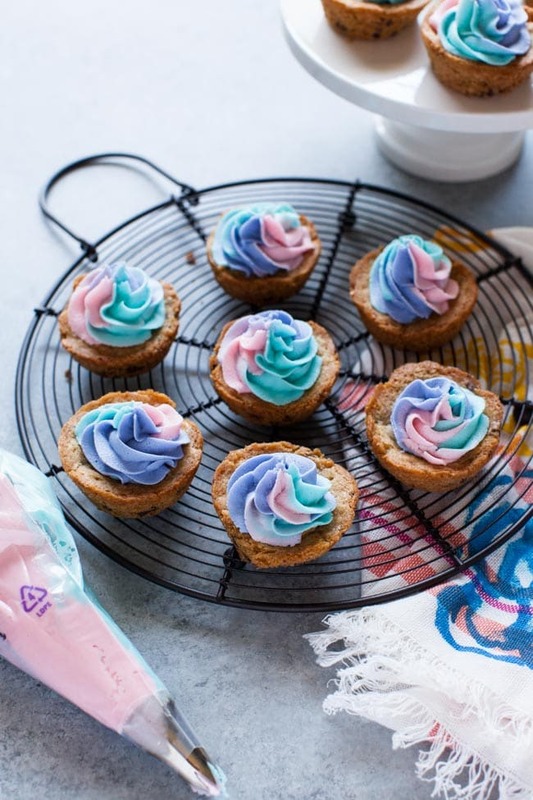 The icing would be piped straight into our mouths too! 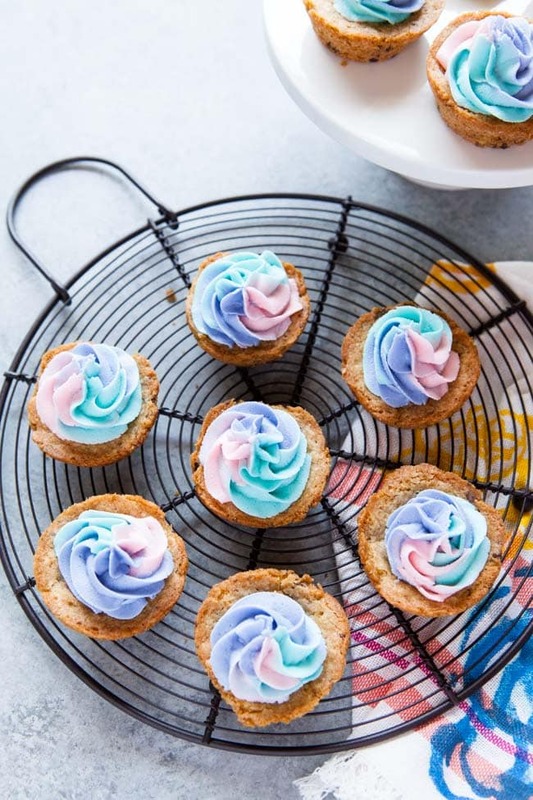 I will be trying the frosting technique, love your colors. I can’t wait to make these. My little girl loves everything unicorn! The little girl in me loves this unicorn icing!! Beautiful! These remind me of the cookie cups you used to be able to get from the mall food court. I am sure your cups taste so much better! Yummo!! These are perfect for Easter! Despite being unicorn colors, it’s pastel so kinda for Easter. My hubby’s work will enjoy these! Thes cupcakes are sooooooooooooooooo cool….my kids will luv them! that’s a different idea! Combo cookie w/ icing sounds great! I love the swirls! So very pretty!! These would be great for a Easter party! I love the colored frosting! These are so cute! I’m always looking for fun recipes like this. My daughter would love to make these with her friends. Thanks for sharing! 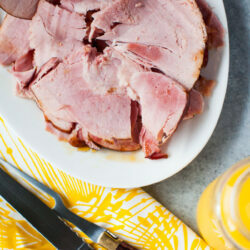 This recipe looks yummy and so perfect for Easter. I definitely want to bake and serve for the family. I love the unicorn frosting! It is so colorful and easy to do! I LOVE the frosting on these. I like how colorful they came out. These would be fun to make and fun to eat. I am going to try this! Wonderful pictures. So clear and crisp. Ice cream scoops come in handy for a lot of things. I love the idea of putting the 3 colors in one bag to create the unicorn effect.